City of Galicia; once the capital of Red Russia. While Przemysl is referred toby the Russian chronicler Nestor in the year 981, no mention of Jews in the city occurs until 1437 ("Akta Grodzkie," xiii., No. 682), and even then they are found there only sporadically, as in the other cities of Red Russia, with the exception of Lemberg. According to the earliest statistics, dating from 1542, eighteen Jewish families were then living at Przemysl, including seven house-owners, who paid annually, "et ratione Judaismi," a rent of 4 Polish gulden, their tenants paying 2 gulden. The earliest legal regulation of the Jewish community at Przemysl was issued by King Sigismund August on March 20, 1559, and was signed by the highest civil and ecclesiastical authorities. The Jews, who had long ("antiquitus") inhabited their own street, had the right of perpetual residence there; they might buy houses in that quarter from Christians, bequeath them, and enjoy all the commercial privileges of Christians. 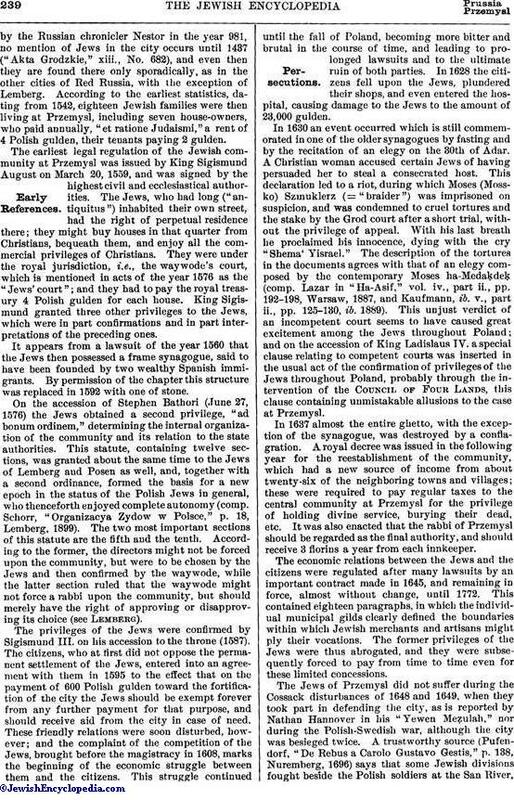 They were under the royal jurisdiction, i.e., the waywode's court, which is mentioned in acts of the year 1576 as the "Jews' court"; and they had to pay the royal treasury 4 Polish gulden for each house. King Sigismund granted three other privileges to the Jews, which were in part confirmations and in part interpretations of the preceding ones. It appears from a lawsuit of the year 1560 that the Jews then possessed a frame synagogue, said to have been founded by two wealthy Spanish immigrants. By permission of the chapter this structure was replaced in 1592 with one of stone. On the accession of Stephen Bathori (June 27, 1576) the Jews obtained a second privilege, "ad bonum ordinem," determining the internal organization of the community and its relation to the state authorities. 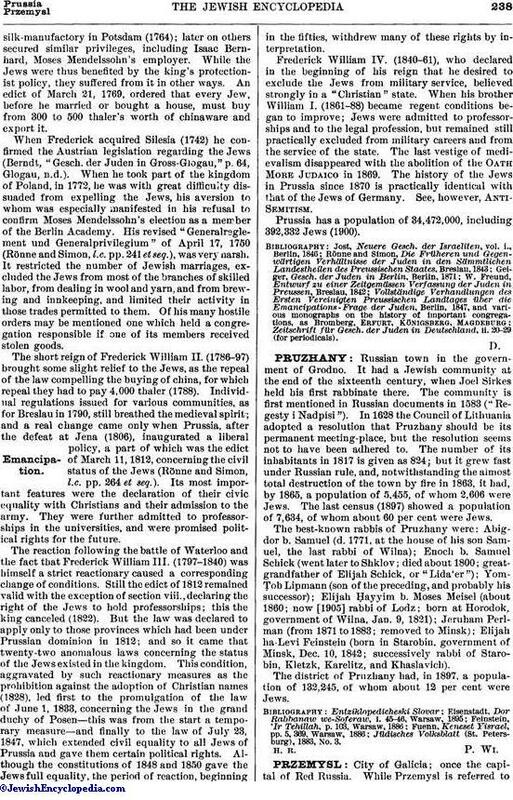 This statute, containing twelve sections, was granted about the same time to the Jews of Lemberg and Posen as well, and, together with a second ordinance, formed the basis for a new epoch in the status of the Polish Jews in general, who thenceforth enjoyed complete autonomy (comp. Schorr, "Organizacya Zydow w Polsce," p. 18. Lemberg, 1899). The two most important sections of this statute are the fifth and the tenth. According to the former, the directors might not be forced upon the community, but were to be chosen by the Jews and then confirmed by the waywode, while the latter section ruled that the waywode might not force a rabbi upon the community, but should merely have the right of approving or disapproving its choice (see Lemberg). The privileges of the Jews were confirmed by Sigismund III. on his accession to the throne (1587). The citizens, who at first did not oppose the permanent settlement of the Jews, entered into an agreement with them in 1595 to the effect that on the payment of 600 Polish gulden toward the fortification of the city the Jews should be exempt forever from any further payment for that purpose, and should receive aid from the city in case of need. These friendly relations were soon disturbed, however; and the complaint of the competition of the Jews, brought before the magistracy in 1608, marks the beginning of the economic struggle between them and the citizens. This struggle continued until the fall of Poland, becoming more bitter and brutal in the course of time, and leading to prolonged lawsuits and to the ultimate ruin of both parties. In 1628 the citizens fell upon the Jews, plundered their shops, and even entered the hospital, causing damage to the Jews to the amount of 23,000 gulden. In 1630 an event occurred which is still commemorated in one of the older synagogues by fasting and by the recitation of an elegy on the 30th of Adar. A Christian woman accused certain Jews of having persuaded her to steal a consecrated host. This declaration led to a riot, during which Moses (Mossko) Szmuklerz (= "braider") was imprisoned on suspicion, and was condemned to cruel tortures and the stake by the Grod court after a short trial, without the privilege of appeal. With his last breath he proclaimed his innocence, dying with the cry "Shema' Yisrael." The description of the tortures in the documents agrees with that of an elegy composed by the contemporary Moses ha-Medaḳdeḳ (comp. Lazar in "Ha-Asif," vol. iv., part ii., pp. 192-198, Warsaw, 1887, and Kaufmann, ib. v., part ii., pp. 125-130, ib. 1889). This unjust verdict of an incompetent court seems to have caused great excitement among the Jews throughout Poland; and on the accession of King Ladislaus IV. a special clause relating to competent courts was inserted in the usual act of the confirmation of privileges of the Jews throughout Poland, probably through the intervention of the Council of Four Lands, this clause containing unmistakable allusions to the case at Przemysl. In 1637 almost the entire ghetto, with the exception of the synagogue, was destroyed by a conflagration. A royal decree was issued in the following year for the reestablishment of the community, which had a new source of income from about twenty-six of the neighboring towns and villages; these were required to pay regular taxes to the central community at Przemysl for the privilege of holding divine service, burying their dead, etc. It was also enacted that the rabbi of Przemysl should be regarded as the final authority, and should receive 3 florins a year from each innkeeper. The economic relations between the Jews and the citizens were regulated after many lawsuits by an important contract made in 1645, and remaining in force, almost without change, until 1772. This contained eighteen paragraphs, in which the individual municipal gilds clearly defined the boundaries within which Jewish merchants and artisans might ply their vocations. The former privileges of the Jews were thus abrogated, and they were subsequently forced to pay from time to time even for these limited concessions. The Jews of Przemysl did not suffer during the Cossack disturbances of 1648 and 1649, when they took part in defending the city, as is reported by Nathan Hannover in his "Yewen Meẓulah," nor during the Polish-Swedish war, although the city was besieged twice. A trustworthy source (Pufendorf, "De Rebus a Carolo Gustavo Gestis," p. 138, Nuremberg, 1696) says that some Jewish divisions fought beside the Polish soldiers at the San River,near Przemysl, and another authority ("Teatrum Europæum," vii. 820, Frankfort-on-the-Main, 1685) states that a Jew acting for a colonel was captured by the Swedes in the siege, this story being confirmed by documents in the archives. Although the city did not suffer, the consequences of the war were disastrous to the Jews, who were ruined by the war taxes and by plunderings on the part of the Polish soldiers quartered in the city; so that in 1661, to raise a larger loan, the community was obliged to mortgage its synagogue to the nobility. According to a statistical document of 1662, there were eighty Jewish merchants in the city, mostly small dealers, some braiders, apothecaries, and grocers, and one dealer in guns, armor, and war material. During the last three decades of the seventeenth century and throughout the eighteenth the economic condition of the Jews grew steadily worse, in consequence of the increasing taxes and contributions which they had to pay to assure their existence, obliging them to contract enormous debts among both the nobility and the clergy. The Jews were finally ruined by a conflagration which destroyed the entire ghetto in 1678, leading to a series of debtors' suits. They were so impoverished that they even thought of leaving the city, when King John Sobieski (1674-96) extended the time for the payment of their debts. King Augustus II., who had confirmed their former privileges in 1700, exempted the Jews for twenty years from all taxes paid for their right to brew mead and beer, which were among the principal articles of commerce of Przemysl; but ten years later he repealed his decree. The community was further disrupted by internal dissensions; and on account of the increasing taxes which the directors found themselves obliged to levy in order to pay the debts due the clergy and the nobility, so many Jews left the ghetto that the way-wode forcibly checked the emigration. 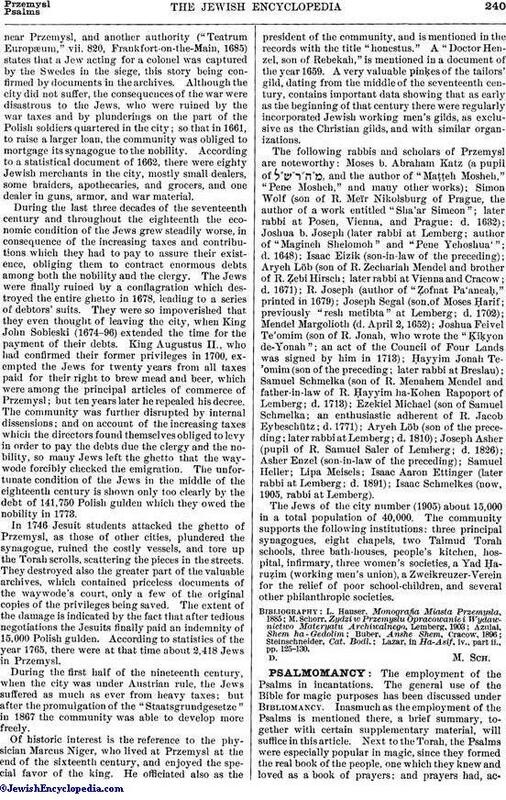 The unfortunate condition of the Jews in the middle of the eighteenth century is shown only too clearly by the debt of 141,750 Polish gulden which they owed the nobility in 1773. In 1746 Jesuit students attacked the ghetto of Przemysl, as those of other cities, plundered the synagogue, ruined the costly vessels, and tore up the Torah scrolls, scattering the pieces in the streets. They destroyed also the greater part of the valuable archives, which contained priceless documents of the waywode's court, only a few of the original copies of the privileges being saved. The extent of the damage is indicated by the fact that after tedious negotiations the Jesuits finally paid an indemnity of 15,000 Polish gulden. According to statistics of the year 1765, there were at that time about 2,418 Jews in Przemysl. During the first half of the nineteenth century, when the city was under Austrian rule, the Jews suffered as much as ever from heavy taxes; but after the promulgation of the "Staatsgrundgesetze" in 1867 the community was able to develop more freely. Of historic interest is the reference to the physician Marcus Niger, who lived at Przemysl at the end of the sixteenth century, and enjoyed the special favor of the king. He officiated also as the president of the community, and is mentioned in the records with the title "honestus." A "Doctor Henzel, son of Rebekah," is mentioned in a document of the year 1659. A very valuable pinḳes of the tailors' gild, dating from the middle of the seventeenth century, contains important data showing that as early as the beginning of that century there were regularly incorporated Jewish working men's gilds, as exclusive as the Christian gilds, and with similar organizations. The following rabbis and scholars of Przemysl are noteworthy: Moses b. Abraham Katz (a pupil of and the author of "Maṭṭeh Mosheh," "Pene Mosheh," and many other works); Simon Wolf (son of R. Meïr Nikolsburg of Prague, the author of a work entitled "Sha'ar Simeon"; later rabbi at Posen, Vienna, and Prague; d. 1632); Joshua b. Joseph (later rabbi at Lemberg; author of "Maginch Shelomoh" and "Pene Yehoshua'"; d. 1648); Isaac Eizik (son-in-law of the preceding); Aryeh Löb (son of R. Zechariah Mendel and brother of R. Ẓebi Hirsch; later rabbi at Vienna and Cracow; d. 1671); R. Joseph (author of "Ẓofnat Pa'aneaḥ," printed in 1679); Joseph Segal (son of Moses Ḥarif; previously "resh metibta" at Lemberg; d. 1702); Mendel Margolioth (d. April 2, 1652); Joshua Feivel Te'omim (son of R. Jonah, who wrote the "Ḳiḳyon de-Yonah"; an act of the Council of Four Lands was signed by him in 1713); Ḥayyim Jonah Te'omin (son of the preceding; later rabbi at Breslau); Samuel Schmelka (son of R. Menahem Mendel and father-in-law of R. Ḥayyim ha-Kohen Rapoport of Lemberg; d. 1713); Ezekiel Michael (son of Samuel Schmelka; an enthusiastic adherent of R. Jacob Eybeschütz; d. 1771); Aryeh Löb (son of the preceding; later rabbi at Lemberg; d. 1810); Joseph Asher (pupil of R. Samuel Saler of Lemberg; d. 1826); Asher Enzel (son-in-law of the preceding); Samuel Heller; Lipa Meisels; Isaac Aaron Ettinger (later rabbi at Lemberg; d. 1891); Isaac Schmelkes (now, 1905), rabbi at Lemberg). The Jews of the city number (1905) about 15,000 in a total population of 40,000. The community supports the following institutions; three principal synagogues, eight chapels, two Talmud Torah schools, three bath-houses, people's kitchen, hospital, infirmary, three women's societies, a Yad Ḥaruẓim (working men's union), a Zweikreuzer-Verein for the relief of poor school-children, and several other philanthropic societies. Lazar, in Ha-Asif, iv., part ii., pp. 125-130.